Former Dark Water Refinery, recently decommissioned and passed to the Liandri Arena Division for conversion into a Tournament Arena. The refinery processed Dark Water from the vast lake below and refined it for use in Liandri Plasma Reactors. The resultant mineral by-products were also valuable as components in the manufacture of body armour for Tournament participants. The ground floor was originally the sealed dark water refining tank with the central rotunda housing the refining rods and refining machinery, with a control room located where the Rocket Launcher now sits. The ground floor shows the corrosion of the refining process while the upper floors housed clean rooms, barreling room and living space for the engineers and scientists who were 'camped' at the refinery in 12 month rotations. Liandri arena designers opened the tank and created the various ramps up to the first floor. While most of the equipment from the refinery was salaged, unsalvagable/broken parts were re-used or left in-situ to give the arena its now notorious layout. Wireplay UT2003/4 Community Liaison Officer and Server admin and tournament guy. 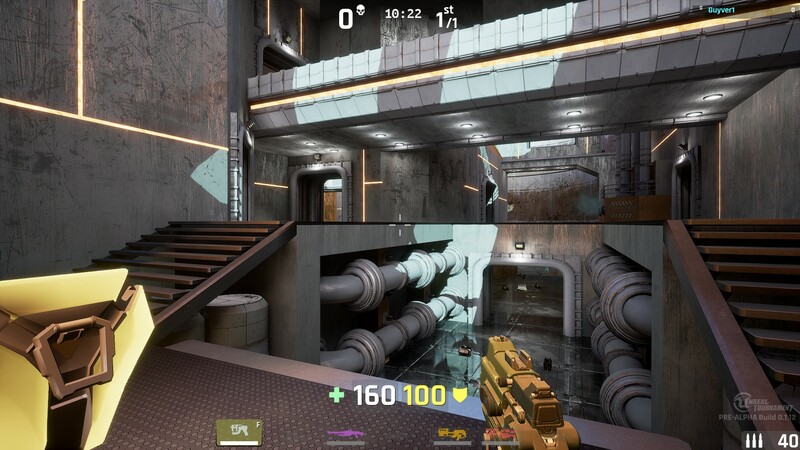 There are a few G1E UT2004 maps out there. I primarily did these modification for the 1v1 competitive scene at the time. Due to the alpha nature of the game currently I am only building this map based on Epic/High settings.